Microphone stands support/hold expensive equipment. Although they are the most important stage accessory, they are all too often not thought too much about until the stand fails and an expensive mic lands on the floor. The ideal stand significantly maximizes performance. Overall quality of performance depends on the sound emitted from the mic, which is supported on the stand. 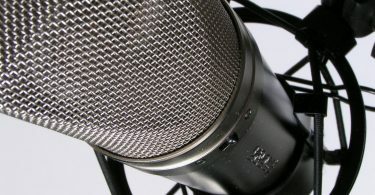 If the mic stand cannot be properly adjusted, the grip slips, or it cannot sufficiently support the microphone in a desired fixed place for optimal sound quality, the performance suffers. There are a variety of different mic stands to choose from. It is necessary to know what styles are available in order to choose the best one(s) for your purpose and venue. It is also helpful to know what each type of mic stand offers in regard to benefits and drawbacks. Microphone stands hold expensive pieces of equipment (microphones), so the musician does not have to. When properly placed, microphone stands enhance the quality of the voices and instruments, sounds and tones. Mic stands may be purchased to outfit a choir, orchestra, or jazz or rock band. Each microphone stand is different, depending on intended use, type, size, shape, and quality of material it is constructed from. Microphone stand bases can be round or tripod type. Round bases are heavier and are considered to be more stable. Microphone stands with solid bases are extremely sturdy, making them ideal for high traffic areas or extreme performances. It is typical to find them in recording studios where sound equipment does not necessarily need to be mobile. Performers use them because they consume less floor space and do not create a trip hazard, like tripod stands do. Folding tripod-base mic stands are more compact for storage. They collapse and pack easily to take on the road for gigs. They also quickly unfold for setup. The drawback of tripod stands is that they can become a tripping hazard on a dark stage. Stage mic stands typically include the straight (floor model) round- or tripod-base, boom arm, gooseneck, and overhead or drum mic type stands. 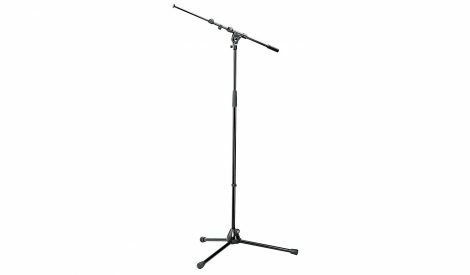 Straight (floor model) – adjustable-height, vertical tube shaft type microphone stands are the most basic and most easily recognized. They are typically stage models and may have a round base. Some more elaborate models have locking caster wheels for easy portability. Tripod – As common as round base stands. 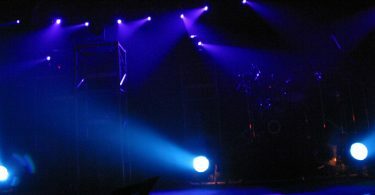 Performers may elect to use a tripod stand due to space or that it allows the performer to more comfortably stand closer to the mic. Desk – Short or low-profile versions of straight type stands. They may be used for pocasts, “bedroom recordings,” or presentations. Musicians typically use these stands for kick drums or guitar cabs. Boom Arm – Allows you to have a longer reach. They are convenient when floor space is limited. They are available in either a fixed or adjustable (telescoping) lengths and may have a round or tripod type base. These types of mic stands can be angled to pick up sound without obstructing the performance. Boom arm mic stands are best suited for singer/musicians that play keyboard or drums. Overhead – The largest, professional, and most expensive of all stands. They are used when extreme heights and angles are required, such as in studios above green screens or with drum overheads. Microphone stand attributes enable them to be more mobile, versatile and functional. Boom Arm – have microphone clip attachments mounted to the tops of microphone stands. The boom arm enables the mic to move horizontally, allowing it to be hands-free without a vertical shaft obstructing the performer’s movement. A boom arm is also useful when space is at a premium. Gooseneck – A microphone attachment that affords greater flexibility. Some musicians have discovered the “bottomless mic stand.” Accidently created by Freddie Mercury (Queen), a bottomless mic stand is one that is hand-held and does not have a base. Various attachments adapt it to where and how it will be used. The clip – attached to the stand with screws. It holds the microphone. Clips easily break but can be replaced. The post – between the base and the clip. It is a series of telescoping tubes that may be extended. Each tube fits inside another. The clutch – makes it possible to adjust the height of the stand. They are generally designed to be operable with one hand. The most common clutch is the one used on a straight stand. • Necessary accessories (pop filters, carry bags, shock mounts). Although budget and cost may be primary concerns, quality and functionality remain important factors. The best rule to follow is to purchase the best-quality microphone stand you can afford. A good mic stand is not necessarily expensive. But, a less expensive microphone stand may not be well-made, very well balance, or sturdy. It may not substantially support higher-end microphones or it may begin to sag over time when positioned at extreme angles. It may fall apart or not maintain its grip (sliding down) during a gig. It is important the mic stand does not allow the mic to slip or drop. 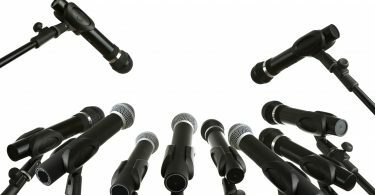 Microphones can be very costly to replace. Another consideration is the needed accessories that must be added. The overall total of your mic stand and needed accessories may start to add up. Higher-end models initially cost more, but they also come with more amenities, such as more inclusive and/or longer warranties, field replacement parts and service, quality accessories as well as overall better quality, reliability, and longer life that won’t disrupt your performance schedule and career. • Select one that is made of the highest quality materials (metal is sturdier than thick plastic). • Avoid sale or bargain-priced stands that cannot be returned or replaced if they fall apart. • Don’t choose a mic stand based on its clip (chips easily break but do not cost much to replace). • Select a mic stand with a high-quality clutch that will not quickly wear out. 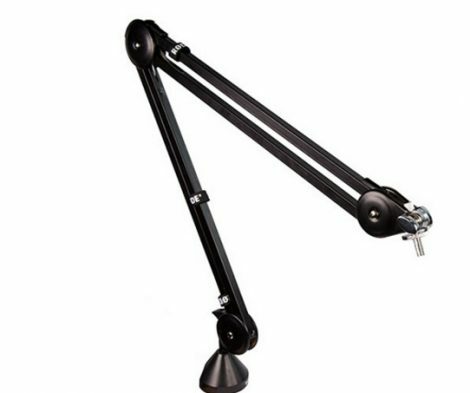 • Verify the boom arm or gooseneck is sturdy and can support a heavier mic over extended periods. Microphone stands can range from “cheap” stands to premium, multi-purpose models. There are cost-effective reliable mic stands, just as there are deluxe stands. 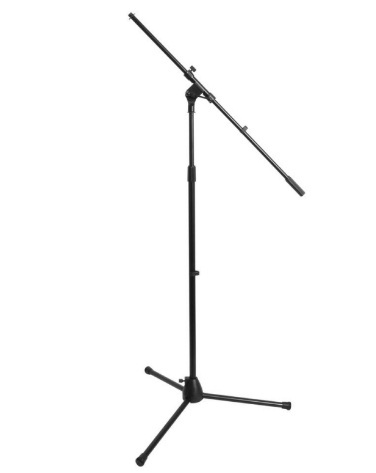 The following competing microphone stands for musicians are categorized according to price, since that seems to be the primary focus due to budget and number of stands needed. 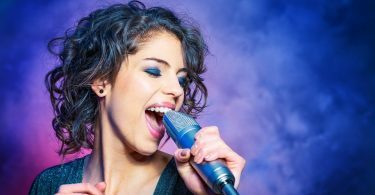 Within the low-end, medium-priced, and high-end categories, mic stands are selected according to type, product specifications, and customer reviews, including the benefits and drawbacks (pros and cons) of each product. Less expensive mic stands are not always “cheap.” But they should not be expected to hold up under continued wear and tear or for a very long time. Cost-effective mic stands are for budget minded musicians that need at least short term quality with the least required outlay necessary. 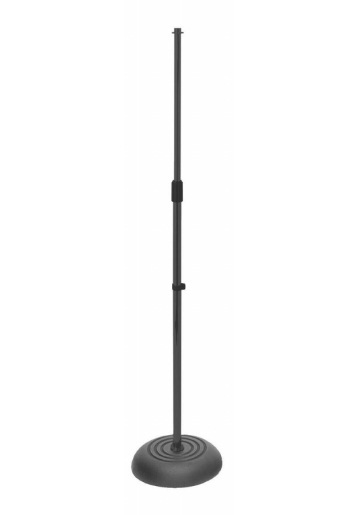 This black On Stage Stands MS7201B model is an industry standard, circular-base mic stand design that has a few features its competitors do not. It has a large, sturdy 10 in. diameter sand-cast base that weighs approximately 7 – 9 lbs. (light enough for road use). The stand’s shaft has a black powder coat finish that is applied to all MS7201B tubing. The 5/8 in. tubing has a 27-solid cast threaded (screw-together) upper shaft end that holds mic clamps and accessories. The mic stand height adjusts from 34 inches to 60 inches. The internal counter clutch holds the upper shaft while the desired height adjustment is made. The zinc die-cast clutch is engaged and securely locks the stand height in place. 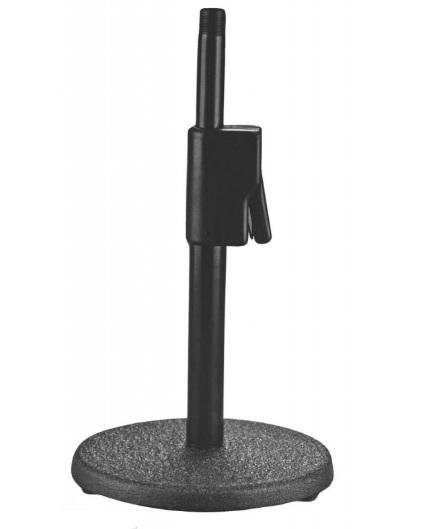 The MS7201B round mic stand base may be used with a telescoping boom mic. The On Stage Stands brand markets products that are affordable and durable to amateurs and professionals alike. The standard 10 in. diameter, 7 lb. 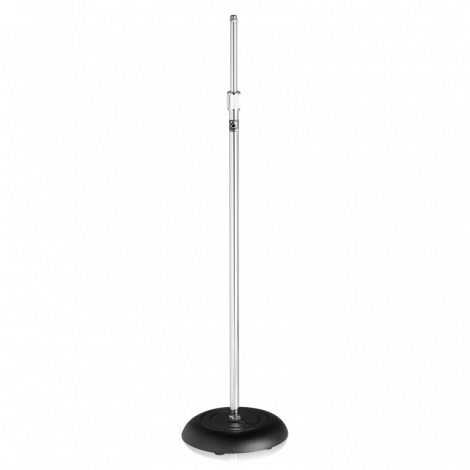 On Stage Stands MS7201B mic stand is also available in chrome ($25.95) and in white finish ($30.12). The Samson MK-10 Microphone Boom Stand is a durable, lightweight, compact, tripod base boom arm-ready mic stand. The tripod stands is constructed from sturdy all-steel material with a smooth black finish. It also collapses and easily folds down to 25 inches, making it ready for quick transport anywhere. It is recommended to be best for stage, studio and home recording. The On Stage Stands MS7701B lightweight, 5 lb., black powder-coated Tripod Boom Microphone Stand is constructed from hybrid sheet metal with composite leg housing for unbreakable durability. It has a 5/8 in., 27-solid cast threaded (screw-together) upper shaft end. The mic stand’s boom is a long 36 inches with a molded plastic counterweight. The height adjusts from 36 inches to 63 inches. The MS7701B is a euro-style boom with separate clutches to adjust the length and angle of the boom. The zinc die-cast clutch engages and securely locks the stand height in place. It also allows the performer to easily make one-handed boom angle adjustments during their performance if they feel the need to do so. The entire unit (boom and tripod) breaks down and folds flat for easy transport. 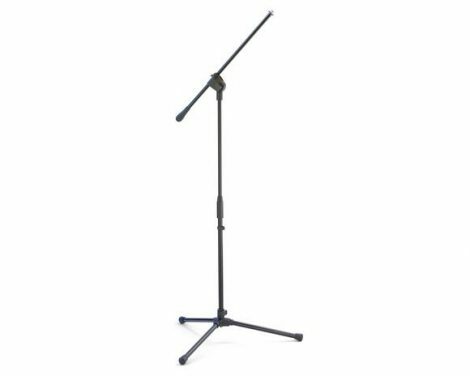 This lightweight On Stage Stands model is also available in chrome ($37.42). The On Stage DS7200QRB Quick-Release Adjustable Desktop Stand is a heavy, sand cast metal base, black, standard-thread quick-release desktop mic stand. The design allows fast two-handed operation. The sturdy 6-inch diameter base has five rubber feet for stability. It has a standard 5/8 in., solid cast threaded end. The mic stand height adjusts from 9-1/2 in. to 16 in. When you purchase equipment in the mid-range, you get the added durability and security that the equipment will last longer and better sustain continued wear and tear without failing. Mid-priced mic stands hold up better over time without sagging (booms) or slipping (shafts). 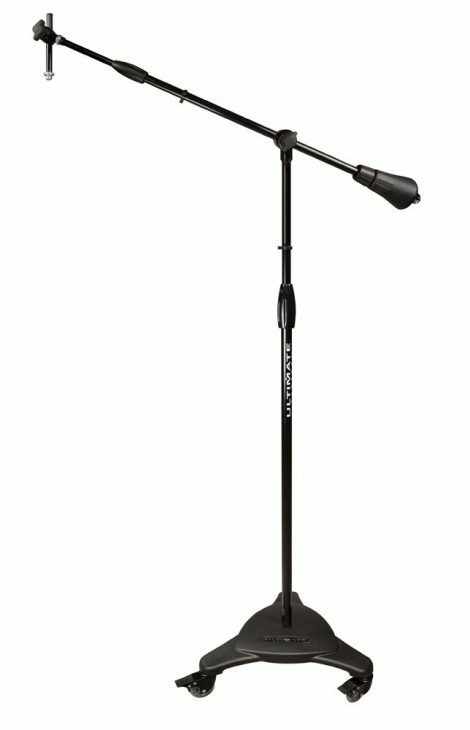 The Atlas Sound MS-10C is the durable chrome-tube, round metal-based, stick-type mic stand that’s been the traditional mainstay stand for years on stages and in venues everywhere. It is representative of the industry standard for microphone stands. The MS-10C is a versatile stand. It has the Atlas Sound-brand three-piece, wear-proof clutch whose locking control resists endless studio and stage handling and abuse. The MS-10C has an oversized 10 inch diameter die-cast base that features edge concentrated weight distribution for added stability. The metal base is equipped with rubber pads that absorb floor vibrations as well as protect various floor surfaces. The standard 5/8 in. and 7/8 in. diameter tubing is formed from cold rolled steel. The MS-10C mic stand shaft is fully-adjustable and extends vertically from 35 inches to 63 inches. The 5/8 in. tubing has a 27-solid cast threaded upper shaft end that allows the shaft tubing pieces to be screwed together and hold mic clamps and accessories. Top and bottom lock-nut rings are included to enable secure positioning. The DR Pro Quick Release is a heavy duty, lightweight, easy to adjust, black powder-coated tripod mic stand designed for stage or studio. The durable black powder coat finish is guaranteed to be long-lasting. This stand can easily adjust from 39 inches to 65 inches using the one-hand squeeze trigger mechanism. The trigger design ergonomically provides a solid grip for faster height adjusting whether on stage performing or in the studio between takes. The DR Pro collapses and folds into a compact ultra-portable unit for easy transport. German-based K&M (Koenig & Meyer) is the industry standard.The professional K & M Microphone Stand with Telescopic Boom Arm is a more compact, transportable model of their 210/2 classic edition. It combines the longer-legged 201A/2 mic stand with their 211/1 telescopic boom arm. The mic stand is constructed from Swiss steel. It has a zinc die-cast base and an adjustable telescopic boom. The stand’s height adjusts from 35-1/2 inches to 63-1/8 inches. Customers suggest the best uses for this product range from home studio and amateur recording to outdoor events and performances, and professional recording. The Rode PSA 1 Swivel Mount Studio Microphone Boom Arm is a professional, dual axis swivel studio desk mount. It rotates 360 degrees and has a boom reach of 32-33 inches from the base. The Rode PSA 1 comes with two desk mounting options: a desk mount and a recessed hole mount. It is designed for the Podcaster and RODE Podcaster. It supports and adapts to most mics on the market between (1.5 lb. to 2.4 lbs. when combined with shock mount). Most studios spare no expense to get the very best, top-end equipment and microphone stands because they have learned that the extra cost is worth it. High-end products typically include warranties, parts replacement, service, and support amenities. The Atlas Sound MS25E is a durable, heavy-duty high-end microphone stand that is ideally suited for a broad range of performance, stage, studio, and recording applications. Mic stand quality begins with its oversized 7/8 in. and 1-1/8 in. diameter tube assembly construction. The MS25 mic stand also showcases an integral air suspension system intended to protect even the most sensitive microphones. This versatile mic stand extends up to 62 inches. It features the Atlas Sound-brand three-piece, wear-proof clutch that provides secure, fast, and quiet height adjusting. The MS25E’s locking control resists continuous studio and stage handling, packing, abuse, and general wear and tear. The MS-10C oversized triangular base provides maximum stability. It incorporates edge concentrated weight distribution and sculpted edges for added stability. It can easily sustain booms without wobble. The Ultimate Support TOUR-T-TALL Tripod Mic Stand is designed for taller professionals and those in touring and backline companies and rental facilities. Each TOUR-T-TALL stand is constructed from sturdy 1.1-inch diameter steel tubing. The oversized tubing adds durability for road travel. It is equally useful when overhead mic-ing is necessary. This TOUR mic stand is fully functional for US or overseas performances. All TOUR Series mic stands feature Ultimate Support’s patented universal mic attachments, which have top threads that adapt to standard US or metric-sized threads. The top threads fit either type of threaded mic clips or accessories for use anywhere. The TOUR modular base design features three weighted tripod legs for stability. Each leg has a well-attached, secure rubber foot cap that is guaranteed not to fall off. TOUR bases also have extremely uncompromising threads combined with a wedge lock that facilitates a much faster equipment setup and break down. The base fits all three (Short, Standard, and Tall) TOUR Series shafts. The TOUR-T-TALL mic stand height may be adjusted to a substantially high 96.5 inches. The heavy duty Quarter-Turn Clutch is a TOUR Series Ultimate Support patented mechanism. The clutch is over-molded to ensure a secure grip that can lock up easier and more quickly than other clutches on the market. 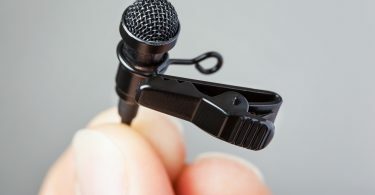 All TOUR microphones are evenly designed so the clutch quickly locks or unlocks with only a quarter turn of the handle. Interchangeable parts simplify maintenance and repair of TOUR Series microphone stands. Because all parts on the Ultimate TOUR Series are interchangeable, they are easily and efficiently also field replaceable. The mic stand bases, for example, are a modular design that has a quick-release connection system allowing any series type base or shaft to be mixed, matched or generally replaced with other models. Set up, tear down and storage is faster and more expedient. The 100% field replaceable, interchangeable parts ensure the mic stand will have a very long lifespan, from its foot caps to the mic adapter. All TOUR Series mic stands are coated with a black hard chrome protective finish. The hard chrome finish is five times more durable than stadium bleacher finishes! The TOUR-T-TALL tripod mic stands, like all TOUR Series mic stands, are guaranteed not to chip, rust, or show wear and abuse. The K&M (Koenig & Meyer) is the industry standard and choice of professionals around the world. 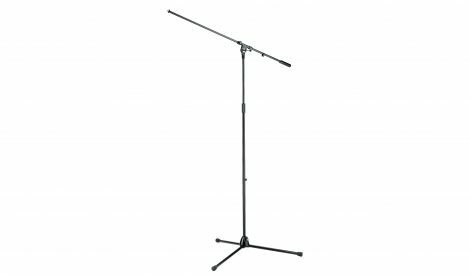 The German-made K&M 21021 Overhead Microphone Stand is a professional mic stand with an extraordinarily compact and transportable telescopic boom arm. It’s reduced size and increased portability surpasses that of the K&M 210/2 classic model. It also combines the longer-legged 201A/2 mic stand with the K&M 211/1 telescopic boom arm. The three adjustable longer legs add more stability and support, and easily fold flat for compact storage and easy transport. 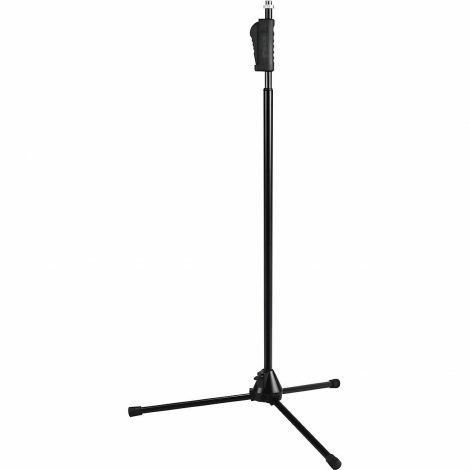 The K&M 21021 mic stand is constructed from Swiss steel. It has a zinc die-cast base and an adjustable and detachable one-piece telescopic boom. It is longer and taller than most overhead mic stands. The fully extended main stand is 6.5 feet tall. The mic stand’s overall height adjusts from 35-1/2 inches to 63-1/8 inches. The solid T-bar mechanism ensures all moving parts of the mic stand remain as adjusted. It is designed particularly for studios and drummers. The Ultimate Support MC-125 Studio Series Microphone Boom Stand is a large, professional, no-tip, mobile mic stand. The MC-125 is considered “the most adjustable studio boom on the market.” It is particularly suitable for home studios, performances, professional recordings, and events. The MC-125 offers a larger than average 22-1/2 inch diameter base. A primary feature of the MC-125 is its three locking 3-3/4 inch caster wheels that allow for smooth and easy movement in all directions, providing studio and stage portability. The wheels are rollerblade-style, which have a lower center of gravity that also provides extra stability. For additional safety, the caster wheels lock in both rotating directions, gaining zero movement. The MC-125 ranges in height from 52 inches to 83 inches, which also accounts for the height of the casters. The long boom extension reaches from 35 inches to 61 inches for perfect placement. The reliable friction-free clutch smoothly raises and lowers the boom arm extension. Threaded shaft and boom sections allow faster and more expedient set up, tear down and storage. It also features a distinctive, easy to adjust, die cast 5.75-lb. counterweight. Interchangeable parts simplify maintenance and repair. All MC-125 parts are interchangeable, making it easy and efficient to field replace them. The 100% field replaceable, interchangeable parts ensure the mic stand will have a very long lifespan, from its foot caps to the mic adapter. Drum mics are typically sold in sets. If more than one microphone stand is needed, there are package deals that include enough stands for every band member plus a few extras. Tripod stands, always a no from me. I can’t tell you how many times I have seen them tripped over and at worst, knocked down. Sure, sometimes it’s that one ‘pal’ onstage who doesn’t know their way around. It’s the experienced guys too though. One shift in its location, a bit too much setup stress, one drink too many are all it takes. I’ll always prefer a firm base!